Having designed their flagship offices in NY’s Time Square, KCD moved on to the client’s Chicago headquarters on North Wells—a space that the client wanted to reflect the industrial look and feel of the area. And with that we off and running. We stripped the floors down to the concrete, sandblasted them and refinished them, giving them their rough-hewn, terrazzo look. Leaving the ceilings exposed let us maintain the industrial feel, painting them black let us bring the scale down to a more human scale. And while “cozy” isn’t usually the word we associate with an industrial warehouse the black ceiling makes the space feel more intimate. 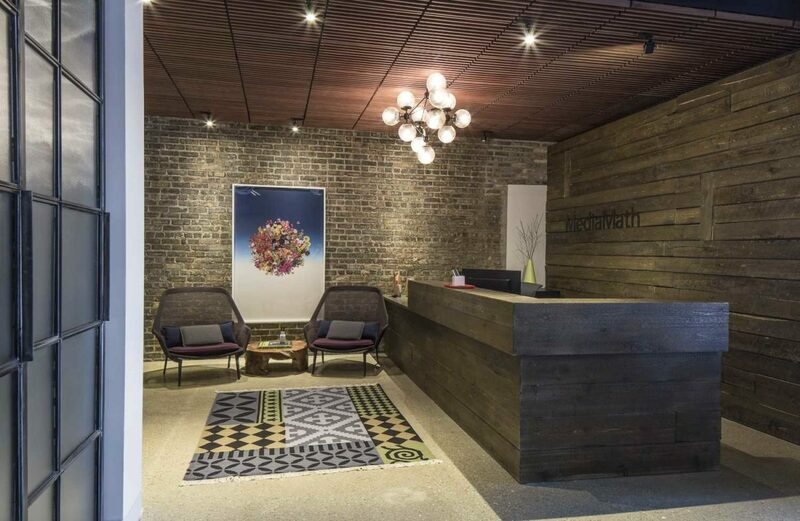 Elements like the recycled railroad ties we used on the walls and reception really reflect the client: raw and edgy, but we integrated the newest, most modern technology and furniture, color, pattern and art to reveal another side of them: sleek and playful. As in most of our tech firm interior design projects, we knew that the client had a lateral office structure with no hierarchy, we had the idea of using steel and glass doors to separate conference rooms and private offices. We loved the way they don’t compromise the visual connection from the meeting areas to the workspaces; we also loved how they supported the client’s belief of inclusivity and transparency. Working such long hours we knew these engineers needed an escape and what better way to do that than through time travel? So KCD indulged their every (self-professed) tech geek fantasy and found the one place licensed to make a Doctor Who TARDIS. Shipped from England, and reconstructed in the large open space, it double duties by also providing a space for some privacy, if needed.